Our spring Gardening Tips are an inspiring way get gardening! Here are some Spring Gardening Tips from my garden to yours. To ensure that your garden is everything you want it to be, prepare with the right garden supplies, tools, seeds, and more. Get garden tools that you can work with comfortably, that enhance your gardening experience. Buy quality tools and store them indoors inside a garden shed or garage out of the weather for the winter. Start your spring gardening with clean garden tools. Clean up all of your tools before you store them, so they don't rust. (This should really be done in the fall when you are finished for the season). Check out these spring gardening tips for a better garden, with lots of color. The first signs of life in the garden being in late winter in my area. It is always exciting to take a garden tour looking for new growth from bulbs and perennials. Don’t let winter slow you down, start preparing for your spring planting with Mastergardening.com. Free shipping over $100. A great way to keep track of what you have done and when you have done it to your garden is to keep a garden journal. You journal could be as simple as using a calendar or a notebook. But we all forget things and times so this way you can write down when you planted something, such as lettuce seed and then you will know when to expect to start seeing them come to life. From spring gardening tips to a tour of year round gardens at my home visit my gardens. You will find lots of valuable gardening information there. One way to make sure that you have a colorful spring garden is to do some fall gardening chores that prepare your garden for spring. 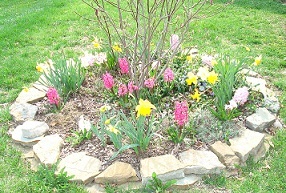 Normally the first signs of life in my garden are the daffodills and hyacinth bulbs that were planted a few years ago. I planted them in late fall. This year they are returning for a third season. Hyacinth blooms are very fragrant and so beautiful with pastel colors, of purple, pink, and white. I have some tulips coming up each year that I am not happy with. They are not blooming, so I intend to remove them and replace them with something else. If you have something that is not blooming like it should in your spring garden, toss it, and replace it with something that makes you happy instead of disappointing you year after year. I have an extensive collection of perennial flowers in my garden. Sedum and daylilies are the first to let me know that they have survived the winter. And this winter has been exceptionally cold here in Kentucky. Find everything from Seeds to Greenhouses and more right here! Click on any item to enter the store. Look your yard over for obvious problems. If you have had any severe winter storms you may have broken limbs in your yard. Remove all limbs and debris before you mow for the first time. Clean up the dead folliage (leaves and stems) from your perennials. Cut it back to the ground level and toss it in your compost bin. Use a Hand Tiller in your garden to till the dirt to soften it for planting. I use a Fiskars brand and I love it. I placed leaves in my raised bed garden last fall, and tilled them into the dirt this year in late winter. Order Garden tools and Plants, repair or replace any damaged tools. You can get garden supplies from our Garden Supply Store on this site. Garden Supply Store on this site. IF YOU ARE LIMITED ON SPACE FOR GROWING YOUR VEGETABLE GARDEN, DONT GIVE UP, CHECK OUT THIS INFORMATION BELOW! Check out your leaf blowers, weedeaters, mowers etc to make sure they are in good working order. Make sure to prune any trees of shrubs that need it. Depending on the species, trim as needed. Removed any dead or damaged branches. Start a compost pile from your plant debris. I intend to build a compost bin this year. It is a great way to add needed nutrients to your garden. Do some research on compost bins and make sure that you don't add harmful items to the composter. I will be adding more information about compost bins soon. Now is the time you can start getting your garden decorations out of storage! 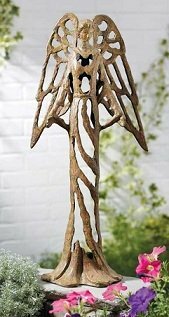 Items such as birdfeeders, bird baths, windchimes planters, wagons, statuary, wheelbarrows etc. You can really make a cozy garden by adding flea market finds to your garden. That is when the fun begins for me. You garden should make your smile. Add some whimsical items, such as frog statues, dog and cats etc. Clean or repair as needed. If they are a little beat up that is ok, that adds charm to the garden. For more garden decor checkout our Garden Decorations Stores Fertilize your soil if needed and do a soil test to determine your soils needs. Here is another of my favorite NEW spring garden tips - sprinkle used coffee grounds in your gardens. Used sparingly coffee grounds have beneficial nutritients that your plants will love, and that means less waste going into the land fields too! Plant cool weather crops as soon as the soil is workable. I am preparing to plant my onion sets and lettuce seed as I write this page. UPDATE, I JUST PLANTED THEM, YAY I GOT TO PLAY IN THE DIRT! And I did spread used coffee ground into the raised beds as I worked the soil too. The garden centers are stocking up on tree and shrubs and perennials. That is your sign. Get these items planted by early spring. Enjoy your spring garden, with these spring garden tips.